Archie Cameron, a missionary pioneer with the United Brethren church, passed away at 2:30 a.m. Thursday morning, September 29. He was 87 years old. His death occurred at the hospital in La Ceiba, Honduras. Archie had lived in Honduras since 1952. For much of this year, Archie had been battling physical problems, including an enlarged heart and kidney ailments. Roger Reeck, a son-in-law living in La Ceiba, said Archie was spending several days a month in the hospital. He had gone into the hospital on Wednesday, September 28, and this time he didn’t leave. The funeral will be held Sunday, October 2, at the Amor Viviente (Living Love) church in La Ceiba. This is not a United Brethren church, but the Bethel United Brethren Church, which Archie founded, wouldn’t be big enough to hold this funeral. Having lived in Honduras since 1951, Archie is extremely well-known and beloved throughout northern Honduras. Archie will be buried in La Ceiba next to his wife, Maisy, who passed away April 23, 2003. Archie has three daughters–Heather, Sharon, and Marilyn–all of whom were born in Canada and arrived in Honduras with their parents in 1952 aboard a ship. Archie and Maisy also adopted three Honduran children: Robert, Dean, and Arthur. Robert and Arthur live in La Ceiba, while Dean lives in Canada. Marilyn and Roger Reeck, missionaries with Wycliffe Bible Translators, also live in La Ceiba. 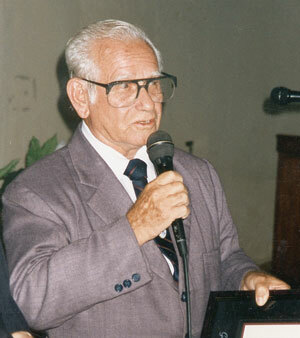 Archie is credited with starting the Spanish-speaking United Brethren work in Honduras. When his family arrived in July 1952, we were working primarily with several English-speaking churches which had affiliated with us in 1945. Those churches, however, chose to go independent in early 1953. Archie immediately cast his full attention to the predominant Spanish-speaking population. He soon founded the Bethel UB church in Honduras, and it became a launching pad for much of the UB work which exists today in Honduras. Archie, along with family members and laypersons from Bethel, conducted evangelistic meetings in villages throughout northern Honduras. People were won to Christ, and churches arose in those villages. Often, Archie and his group were the first evangelical witness in those villages. Today, Honduras National Conference has nearly 90 churches, along with a thriving school (which Archie also started), a campground, and other ministries. It is the fastest-growing of the nine worldwide UB national conferences. Honduras oversaw the starting of mission work in Nicaragua in the 1960s, and Honduras and Nicaragua now oversee mission districts in Costa Rica, El Salvador, and Guatemala. A book about Archie’s life, and about the history of Honduras Conference in general, was published in 2001. It is called Tio Archie. Copies can be ordered from the United Brethren Bookstore for $5 each. The Mid-Atlantic Conference Council, during its September 10 meeting, passed a recommendation that the Mid-Atlantic Conference “officially disband operations as of December 31, 2005, unless otherwise needed.” This recommendation will be voted on the Mid-Year Conference Session on November 12. That meeting will be held at the Prince Street UB church in Shippensburg, Pa. The Council would like to continue a group health insurance policy for active ministers after the disbanding of the conference. It authorized “the Commission of Administration and Finance to continue looking for any and all possibilities for a vehicle for an insurance group plan, and that funds be made available for necessary legal advice….The group health insurance plan for retired ministers, spouses, and widows is more difficult. The conference supplements the premiums on this plan by $90,000 annually from conference funds. If the conference no longer exists, those funds will no longer exist and a number of our older retirees in particular cannot afford to pay for our current plan all by themselves. Our relationship with and commitment to our retirees means that we cannot simply abandon them to their own devices in this situation…. The Conference Council didn’t take formal action on anything relating to clusters, but did spend considerable time addressing the transition to healthy church clusters. Both the national office and the conference Commission on Church Growth and Renewal will be assisting churches to create and/or find clusters this Fall. The Council did not have an opportunity to address the future of Rhodes Grove Camp, but recognizes that the relationship with the camp will need to be re-defined if the Mid-Atlantic Conference no longer exists. Options include transferring ownership to the national conference, creating a membership organization to support the camp, folding it into the Mid-Atlantic Foundation, or establishing a covenant relationship that preserves its UB identity without the legal liabilities of outright ownership. The new Executive Leadership Team held its first meeting September 12-13 in Huntington, Ind. Ron Ramsey chaired the meeting. Tom Brodbeck was chosen as assistant chairperson, and Brian Hughes (Walbridge, Ohio) was named secretary. Leadership Teams. A major item of business was to approve chairpersons and members of the various leadership teams: Healthy Church, Global Ministries, Education, Pastoral Ministry, Administration, and Church Multiplication. Much of that work was done, though a variety of positions remain to be filled. Implement and encourage an atmosphere where multiplication of leaders and churches will be considered as normal. Encourage spiritual formation and renewal within the church of the United Brethren in Christ. Actively equp churches and pastors for effective ministries. Develop a plan to identify and retain those who are being called into fulltime Christian service. Discover, evaluate, and articulate the perceived brand image of the Church of the United Brethren in Christ. 2007 US National Conference. Bishop Ramsey recommended, and the ELT approved, the following: “That the 2007 National Conference be a two-day event held sometime during the period of June 18 through July 7, depending on availability of facilities.” Potential locations are being researched in Lancaster County, Pa., Baltimore, Md., Virginia Beach, Va., and Huntington University, Huntington. Ind. The National Conference would be promoted as a convention/family vacation, with business kept to a minimum and inspiration to a maximum. The event would include high quality music, speakers, teaching, and worship, and special events for children, youth, and pastors’ wives. National Conference Covenant. The National Conference Covenant, approved by the 2005 US National Conference, represents a fundamental change in how we operate. Every local church will need to sign a covenant, which affirms their commitment to eight points. If a church refuses to sign the covenant, then they are saying, “We no longer want to be a United Brethren church.” The ELT agreed that the initial signing of the church covenant would be completed by all churches before January 1, 2006. Bishop Ramsey will be sending out copies of the covenant to each church. You can see a sample copy of the covenant here. Clusters. Another fundamental change approved by the 2005 US National Conference was to reorganize the US churches into clusters, and to phase out the annual conference structure. This is still in its earliest stages. However, Pat Jones, the Director of Healthy Church Ministries, hopes to have the clusters formed by January 2006. A mailing concerning clusters went out in mid-September. All of those materials are also available on the website, along with other information about clusters. Central Conference is sponsoring an October 6 event for ministers of Central, Michindoh, and Sandusky conferences which will focus on the creation of cluster groups. These three conferences are in close proximity, and since the clusters will cross conference boundary lines, churches within these conferences may want to link up. In an email announcement, Superintendent Tom Brodbeck wrote, “All Central Conference ministers are strongly encouraged to be at Camp Cotubic (Bellefontaine, Ohio) on Thursday, October 6 for a day of information and inspiration. Pat Jones, the denomination’s new Director of Healthy Church Ministries, will be present to talk about the formation of clusters and the signing of the Local Church Covenant. We hope that by the end of that day all of our churches will be aligned into a cluster. “We will meet from 10:00 am – 3:30 pm (Ohio time). Lunch will be provided by Camp Cotubic (cost to be announced later). You will need to RSVP before October 1 so that we have a good headcount. We are also inviting churches from Michindoh and Sandusky Conferences. 16 Sep Pastoral Assignment: Alexandria, Ind. Terry Taylor has been appointed as the senior pastor at Innisdale Church (Alexandria, Ind. ), effective September 11, 2005. He had been serving with Rev. Larry Schimmel (the former pastor) as an associate pastor. Pastors and church treasurers will want to note that the Internal Revenue Service and Treasury Department has announced an increase to the optional standard mileage rates for the final four months of 2005. The rate will increase to 48.5 cents a mile for all business miles driven between September 1 and December 31, 2005. This is an increase of 8 cents from the 40.5 cent rate in effect for the first eight months of 2005. The Zanesville United Brethren Church is organizing the 1st annual Tom Ponsot Memorial Classic Florida Scramble to benefit Camp Cotubic. It is scheduled for Saturday, October 1, beginning at 9:00 a.m., at the Woods Golf Club in Van Wert, Ohio. Organizers are looking for hole sponsors at a cost of $100 a hole and are also in need of teams to participate. Tom Ponsot, a strong supporter of Camp Cotubic, passed away earlier this year. Persons interested in participating should send an email to Zanesville UB. Huntington University will accept up to 20 college students displaced by Hurricane Katrina. Tuition, fees, room, and board will be waived for these students for the Fall 2005 semester. Students may enroll in classes, either full- or part-time, on a special emergency transfer basis until September 17. Transcripts will not be required, but students are asked to present a current, valid ID from an accredited college or university damaged or closed by Hurricane Katrina. Students interested in enrolling should contact the Registrar at (260) 359-4011. Huntington University is also organizing volunteers through the Joe Mertz Center to assist with clean up and recovery. Plans are being made to send work teams to the Gulf Coast region in October, January, and March. A special fund has been established to support these volunteer efforts. Interested donors should contact the Advancement Office, or direct their gifts to Hurricane Katrina Relief Fund, Huntington University, 2303 College Avenue, Huntington, Indiana 46750. Huntington University students and personnel are raising funds and collecting supplies for a variety of relief organizations and churches serving storm-stricken areas. People continue asking about Hurricane Katrina relief efforts by the United Brethren church. United Brethren people have a history of responding with funds and as volunteers when disaster strikes. When hurricanes hit Florida, we worked through our UB churches there providing relief. After the tsunami last December, we worked through our workers in India. Because we do not have any close United Brethren connections in the area that has been hit by Katrina, we are referring people to other reputable organizations that are able to mobilize this relief effort. Several reputable organizations are listed below, on a post made August 31. We’d like to add one. Samaritan’s Purse, a Christian relief organization led by Rev. Franklin Graham, is helping to facilitate groups of people who want to help Hurricane Katrina victims repair their damaged roofs and clean up their properties. Their website is www.samaritan.org. This is the same organization that many UB churches have partnered with in Operation Christmas Child shoeboxes. Jody Harr has been named interim pastor of the UB church in Van Wert, Ohio. He was previously pastor of the Willshire, Ohio, UB church.